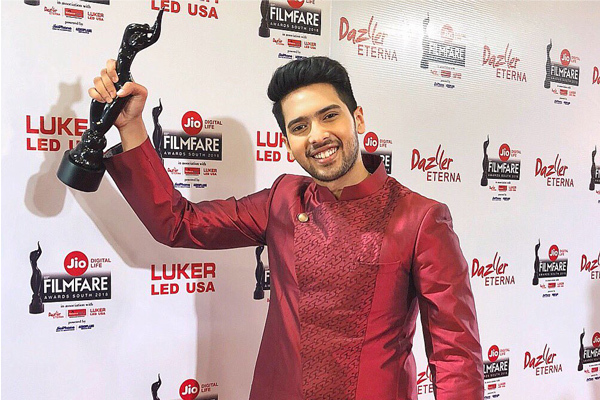 On receiving his first Filmfare Award South, Armaan Malik comments, "It feels like, it was yesterday when I was holding the black lady in my hand for the RD Burman Award for Best Music Debut for the song, Main Hoon Hero Tera. And now I have won another one but this time for a Kannada Song down South. I feel ecstatic to know that people are recognising and appreciating my work not only in Bollywood but in all the other film industries in India. I would like to dedicate this award to the composer of Ondhu Malebillu Arjun Jenya without whom I would not be here receiving this award. Last but not the least, a huge thank you to all my fans in South India who keep loving me and supporting me at every step of my career." The young singer has previously crooned in multiple languages and has been making quite a name for himself in the South film industry. Armaan received his debut nomination in the Best Playback Singer male category for two of his songs. While, the twenty-two-year-old had sung the title song, Hello for Telugu actor Akhil Akkineni, Ondhu Malebillu, which features Kannada stars, Darshan and Deepa Sannidhi. The latter was co-sung by Armaan with Bollywood singer Shreya Ghoshal. The 65th Filmfare Awards South, which took place in Hyderabad did not just award the best of all categories, but appreciated the makers for their outstanding work and motivated the industry to keep working better each day. MUMBAI: Dhvani Bhanushali had an amazing year as she has been part of three chart ranking tracks, Veere (Veere Di Wedding), Ishare Tere (with Guru Randhawa) and Dilbar (Satyameva Jayate). MUMBAI: 5000 Mumbaikars came together at The Mpower Fest – a music concert with a bigger purpose. Popular Bollywood sensations Vishal-Shekhar, Armaan Malik and brother Amaal Mallik and Shalmali Kholgade created magic on Sunday evening in Mumbai with their Bollywood hits. MUMBAI: Global superstar Martin Solveig has unveiled the melodic Weiss remix of his 2018 summer hit My Love, with the French producer’s original so far surpassing 10 million global streams. Mumbai: Armaan Malik's first ever Meet and Greet in association with Smule Entertainment was a grand affair. The meet and greet saw 100 lucky fans flooding the event to meet their favourite singer. The event was hosted at Taj Lands End, Mumbai.